Photo courtesy of Photography by Niki. Keri Ann, from Makeup by Keri Ann, is working with a client. There are many choices when it comes to makeup artists, so what is the difference between a Freelance Makeup Artist and a Makeup Service Company aka Beauty Broker? Individual Freelance Makeup Artists are the smallest of business owners. The individual is solely responsible for seeking, securing and maintaining client appointments. 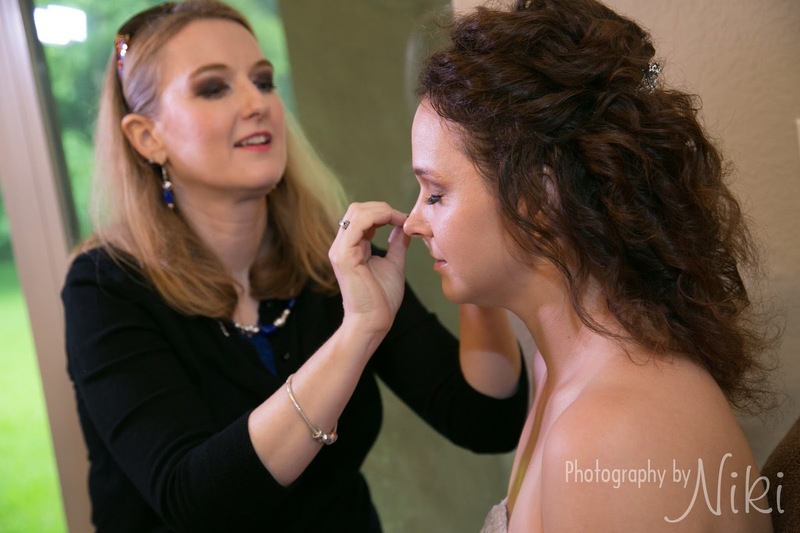 Clients work directly with the Freelance Makeup Artist from initial contact to the day service is provided. The benefit of this relationship, is you get to know your artist and the artist gets to know you and your personality - especially if you have the opportunity to book multiple appointments with the artist. The number of client appointments booked on one day is limited due to time and logistics. Many Freelance Makeup Artists are not hairstylists. Their talents, knowledge and passion is usually only makeup. Some makeup artists I know will do hair, but it’s not their passion. Many hairstylists I know do not want to do makeup - their passion is coloring hair and creating beautiful hairstyles for their clients. There are a few artists who love beauty so much they are passionate about hair and makeup and they do both exquisitely. Beauty Brokers are often small businesses that hire a team of multiple makeup and hair artists. These brokers usually do not charge for multiple artists to attend an event. When you contact a Beauty Broker, you may not speak to the same person on the phone each time, and you are not always guaranteed the same artist for multiple appointments. The person who did your trial run might not do your bridal portrait or even be there on your special occasion. When use Beauty Brokers, you may not know the name of your artist until the artist arrives at the appointment. This can get frustrating when trying to confirm and coordinate details. Beauty Brokers plan the artist(s) day, so your makeup artist may not have freedom to adjust the schedule if you are running late or need to ask for additional services. Freelance Makeup Artists and Beauty Brokers may be similar in pricing. Sometimes the Beauty Brokers do charge less. Beauty Brokers are usually able to take care of large groups with a short time schedule. There are Beauty Brokers who charge the clients significantly for contracted services while the artist who actually services the client appointment is only paid 20% of what the broker collected. Before you book your makeup, think about what type of service you expect, want and need on the day of your special event. A trial run is the best way to test the makeup service and I strongly recommend doing a trial before signing a contract with anyone.